In 2002 the Port Lincoln Chamber was proud to produce Port Lincoln’s first printed visitor guide. 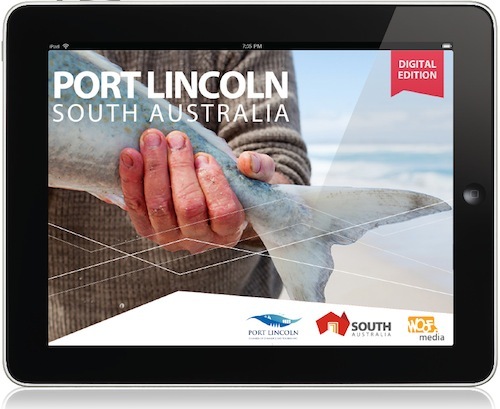 This year, as well as the printed guide, Woof Media and the Port Lincoln Chamber of Commerce & Tourism bring you the first ever dedicated digital visitor guide for Port Lincoln! Prospective visitors to Port Lincoln will learn more about your services and book direct by visiting the Port Lincoln Digital Guide. This is a first for regional South Australia and takes advantage of the growing number of travellers using tablets and smartphones to browse and book their holiday experience, whilst on the road using mobile technology. The new digital guide features include online interactivity like additional photo galleries, video, book now buttons, twitter feeds and more, all featured on your advert or advertorial and you can update your advert during the year! Don’t miss out on being part of this exciting publication. Register your interest by completing the form below and you’ll receive a full prospectus during July. If you have any questions, please contact Woof Media on 08 8682 6093 or email portlincoln@yourvisitorguide.com.au.